As a college student, Missy Mercer watched, enthralled, as French chefs diced and sautéed their way to superb fare with flair on PBS television’s Great Chefs of France, a fascinating diversion for someone whose studies were all about finance. Mercer’s pre-occupation with the art of gourmet was no passing fancy. It was a recipe for success. Mercer has proven herself a skilled chef with a head for business and the determination to follow her passion for food from Auburn University’s campus to the West Coast and eventually back home to roost in Montgomery. 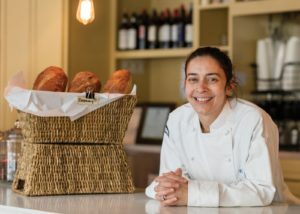 In 2004, the chef-turned-entrepreneur and her husband, Browne, purchased Tomatino’s and Café Louisa, then located in the Fairview area, not with a sense of complacency, but with a desire to see the sister restaurants grow. Mercer has succeeded masterfully, as evidenced by the satisfied customers who regularly return for the hand-tossed pies or the baked goods and barista-made coffee drinks and smoothies. Cast an eye over the menu, and it’s clear this is not your average sandwich shop. An Italian club includes ingredients like capicola ham and mortadella, and you can choose a Chai Bella for dessert — that’s vanilla gelato with chai and honey. These are the flavors of a sophisticated palette influenced by a soupçon of Italian heritage and a dollop of French training. Mercer began the two-year culinary school program on the heels of her undergraduate work. She immersed herself in the experience, from the farmers’ market to fine dining. Mercer’s moniker as chef is not one to be taken lightly. She trained in the art of cordon bleu in San Francisco, a city with the highest number of restaurants per capita in the nation, before going to work for one of the most exacting stewards of flavor and finery, Spago, a standout entry on her impressive resume. While at culinary school, she was mentored by Peter Reinhart, a master of all things bread, who won the James Beard award for sourdough and has written numerous books. Mercer worked on developing products with him after class and collaborated on creating an organic pizza dough recipe for wholesome brand Amy’s Kitchen, based in California. 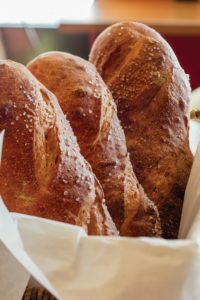 Mercer spent a stint working in fine restaurants in Telluride, Colorado, after culinary school and found her love of the art of baking rising with the tenacity of leavened bread. It was that quest for challenge that took Mercer from Colorado back to the San Francisco area, where she worked in the pressure cooker environment of Wolfgang Puck’s Spago. As chef to the glitterati, Puck’s reputation for excellence and demanding standards is legendary. In a world dominated by male chefs, particularly when she was in California in the ’90s, Mercer found herself breaking barriers to prove herself at Spago. She earned her spot, proving her capability and tenacious spirit. When her mother’s best friend decided to open a fine-dining restaurant in Montgomery, Mercer agreed to be head chef, but again found herself craving the complexity that comes with baking. 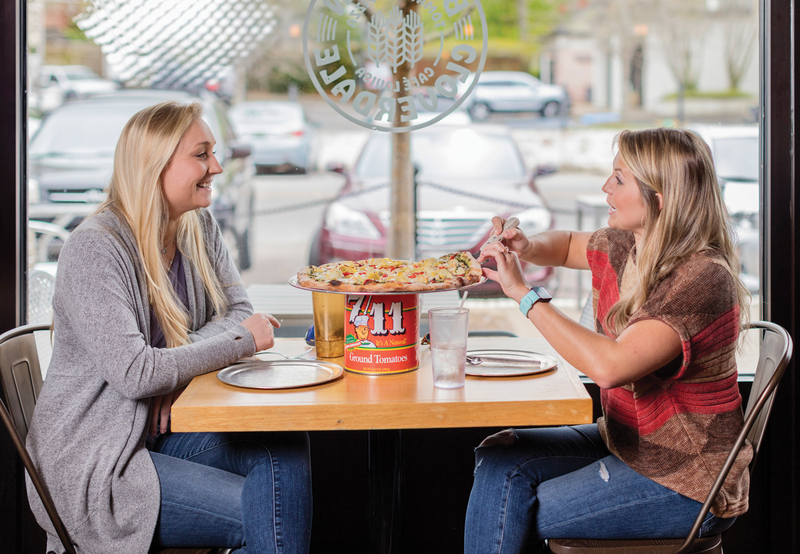 It wasn’t long after her return to Montgomery that Mercer was approached about buying Tomatino’s, a popular pizza restaurant established in 1995. Not one to do things by halves, in 2004, Mercer got married and bought the business, two life-changing events in one year. The nine-month business sale negotiation process was an ordeal, and Mercer changed her mind about the purchase more than once before the final terms were negotiated. Mercer opened a full bakery in conjunction with the café to serve the local need for cakes and baked goods, expanding the square footage and serving cookies, brownies, muffins and an array of treats. When she had twins, her work schedule of 4 a.m. to 7 p.m. was not sustainable. The same drive that led her to become the only female on the hot line in Spago keeps both restaurants on the front burner. She’s not only baking and managing, she’s washing dishes, running food and writing menus. The move to a new location, in the heart of historic Cloverdale, allowed Mercer to consolidate the locations and manage the quality and constancy from pizza dough to gelato. The move also increased sales volume 40 percent in three months in the nearly 5, 000-square-foot space. Deciding to move the business from Fairview was another tough decision Mercer took on while simultaneously moving her family, with twin girls, to a new home. Mercer has proven her versatility as a chef and business owner. When she worked at Spago, where hundreds of food products were moved through an immaculately organized refrigeration system to cooktop to delighted diners, Mercer was in her element. Puck, with a food empire to manage, would visit all of his establishments, spoon in his pocket to taste test at random. And the quality had to be spot on each time. Despite higher costs, Mercer believes an investment in top-shelf ingredients pays off in flavor dividends. She won’t substitute such fine products as Plugra butter, Valhrona cocoa, Callebaut chocolate, Grande cheeses and Stanislaus tomato products. 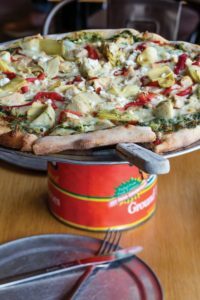 Maintaining those high standards in the eclectically styled pizzeria and in her charm-laden café are the things that keep patrons clamoring for more, which is at the heart of Mercer’s boundless enthusiasm as a cook. Cara Clark and Art Meripol are freelance contributors to Business Alabama. Both are based in Birmingham.